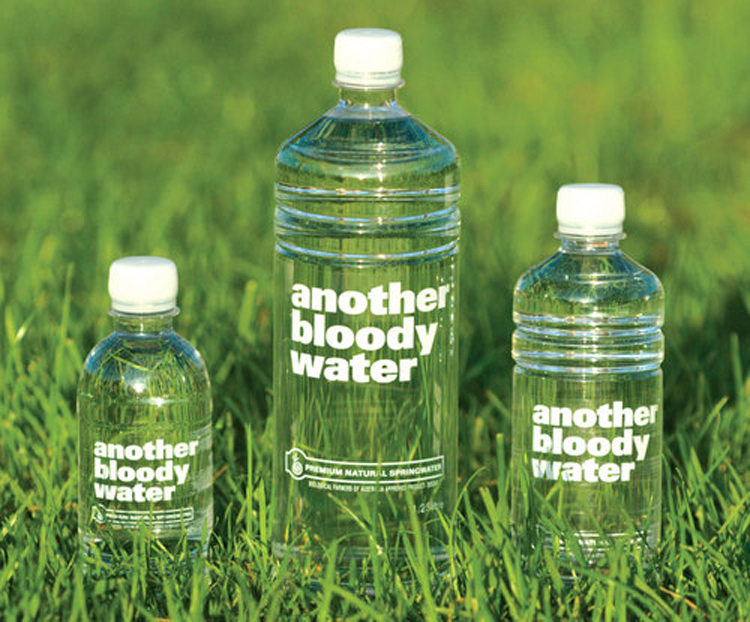 Designed by Subgroup Design Another Bloody Water is a new bottled water brand. From Another Bloody Water website1. Another Bloody Water is natural spring water that comes from the Victorian Alps. 2. The water is sourced from an Aquifer 70 meters below the surface. 3. It is separate from ground water, like rivers and creeks so we are not taking water off the farmers. 4. The water is possibly 100's of years old and is encased in rock granite. 5. The water levels of the Aquifer are constantly checked and it is confirmed it is fully renewable. 6. The water is audited by the Government laboratories, which confirm the typical analysis and process. Ours shows that it's very low in sodium, which is good if you like drinking a lot of water. 7. The water is also certified by the Biological Farmers of Australia (see: BFA link). 8. Its sourced in Victoria, is manufactured totally in Australia. 9. The bottle shape is a proprietary design and unique to Another Bloody Water. 10. The water comes from one source only.